A glossary of selected teletext terms. A more comprehensive list can be found in the Dictionary of Computing (5th Edition, 2004), viewable here. Originally, teletext did not support black text or foreground graphics. The Level 1.5 ‘update’ allowed for use of foreground black, which is now widely (though not entirely) supported. According to the Advanced Teletext Specification, “Alpha Black should be used with caution as it is interpreted by some existing Level 1 and Level 1.5 decoders”. Term sometimes used to describe “capital letters in the middle of a graphic display”, more specifically the letters and limited symbols that can be added in teletext’s graphics mode. The above image utilises ‘blast through alphanumerics’. Note the absence of blank character cells before ‘keeps’ and after ‘it’ – this denotes graphics mode text, AKA blast through alpha. Teletext service operated by the BBC from 1974 to 2012. Also known as a ‘spacing attribute’. A marker occupying one cell on the teletext ‘grid’, changing that row’s attributes from that point. For example, one control code may be placed to change from yellow graphics to cyan text. Some control code functions, such as Flash/Steady can be deactivated with another code later in the row. Ordinarily, control codes output a blank (black) space unless held graphics are used. 1. Mode supported by some televisions that will increase the height of teletext rows on your television. Pressing the DOUBLE HEIGHT button on your remote will ‘zoom in’ on the top half of the teletext screen, while pressing it again will do the same for the bottom half. 2. A control code that will set text or graphics to span two rows instead of one. 1. A new feature introduced prior to 1987 that added colour-coded ‘links’ to the bottom of a page, operated by red, cyan, yellow and green buttons on the remote. This facilitated, amongst other things, the popular multiple choice quiz known as Bamboozle. ARD Text’s version of Fastext is known as TOP-Text. 2. The name of a service operated by Sky in the mid-90s. Also known as blink, a control code that sets graphics or text to flash, or appear and disappear at a roughly 1-second interval (Level 2 implementations allow for longer blink intervals). Often used to highlight important parts of a page, for example a phone number in an advertisement. Not to be confused with your television’s HOLD function (see below). Ordinarily, control codes leave a blank space wherever placed. 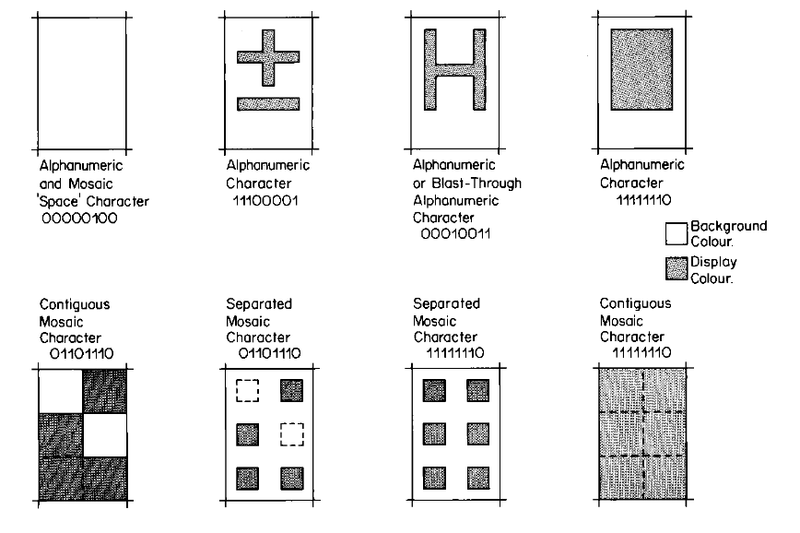 In ‘held’ mode, spaces occupied by control codes will replicate graphics from the previous character cell, filling that gap. 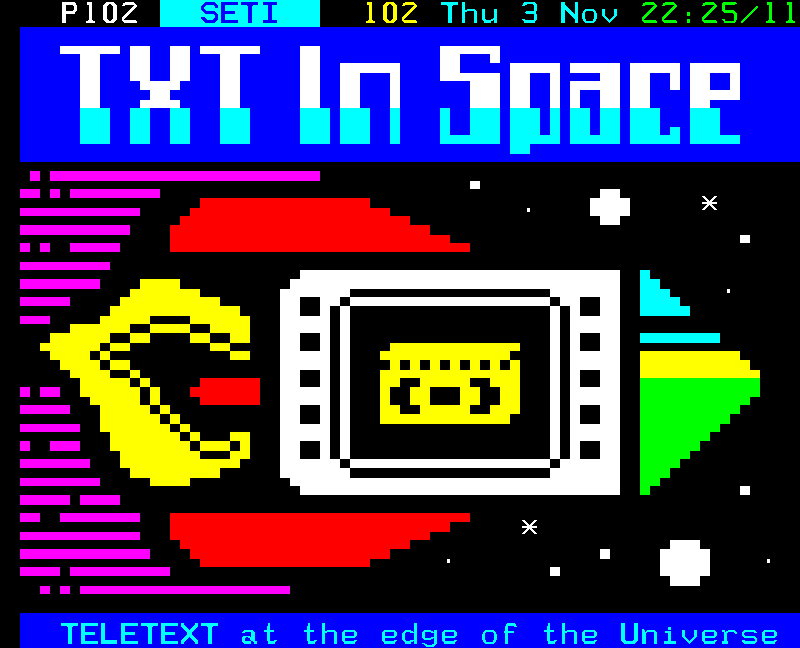 ‘Held graphics’ are a slightly more advanced aspect of teletext design, but can yield impressive rewards. The HOLD key on your remote will freeze the current teletext sub-page on your television so you have time to read it. When you deactivate the HOLD function, your television may not display the next page in the carousel – it will pick up the next sub-page in the broadcast, which could be 23 of 106. 1. Main page of a teletext service, most commonly 100. 2. A button on some teletext remotes that loads up the index page. Name given to a group of 100 teletext pages – for example, pages 100-199. Teletext has eight magazines, omitting pages 000-099 and 900-999. Pressing this button on your remote displays foreground elements on top of the TV broadcast. This allows you to, for example, watch a cricket match with a live teletext scorecard superimposed over the top. Certain parts of a teletext page can be hidden from view until the REVEAL button on your remote is pressed. They will disappear if you press it again. Used to great effect in quizzes (press REVEAL for the answer) and on Channel 4’s Digitiser in the UK. An individual ‘pixel’ constituting one of a set of six in teletext graphics mode. An individual character cell is three sixels tall and two sixels wide. You can fit one letter or symbol in one character cell. 1. (Lower case t, ‘teletext’) The medium transmitting textual news and information via a normally hidden part of a TV broadcast. 2. (Upper case T, ‘Teletext’) Teletext Ltd, a company that provided teletext services in the UK from 1993.